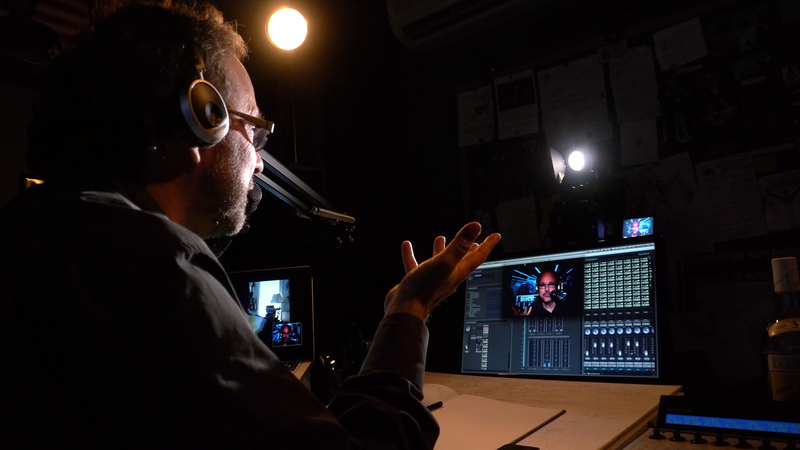 This essay provides an overview of artistic work and experimentation leading to the concept of the Third Space Network: a live Internet broadcast project currently in development for connecting artists, audiences, and cultural perspectives from around the world. In short, the concept of the third space suggests the collapse of the local (first space) and remote (second space) into a third, socially conceived networked space. The third space can be viewed as a new realization of the community of theater in a globally connected culture: a performance space for broadcasted art, a forum for the aggregation of artist streams of media art and dialogue, and an arena for social interaction and audience engagement. The following is a personal artistic history and contextualization of nearly thirty years of live performance, interactive media, installation, Internet art, and the spaces they inhabit. This essay connects my early work in music theater from the late 1980s and early 1990s to more recent networked projects in order to frame the idea of the Third Space Network as a new environment rich in potential for live performance, streaming media, and creative discourse. The roots of my work in media and performance date back to 1988, when I returned from Paris to my home base in San Francisco after a two-year, post-graduate stint as a visiting composer studying electronic music at IRCAM / Centres Georges Pompidou. In those heady, youthful days I was ready to tear down and reinvent what I considered the anachronistic format of the musical concert stage. I began investigating interdisciplinary approaches to expand my musical vocabulary through the media of the stage, which led to extensive research into the history of experimental music theater from the 1960s. I formed Zakros InterArts as a media arts company to create, produce, and present a series of performances exploring the most far flung possibilities of what music theater could be. My research involved hands-on direction of historical works of the avant-garde to conceptualize new forms of my own, new methods for staging multimedia performance through emerging practices and technological resources. For the debut event of Zakros InterArts in 1988, I organized the San Francisco Tape Music Center Retrospective, bringing together pioneering composers and multimedia artists, Tony Martin, Pauline Oliveros, Ramon Sender and Mort Subotnick, who in the early 1960s staged concerts, music theater, dance and film events at the 123 Divisadero alternative art space in San Francisco. They also established one of the first electronic music studios on the West Coast. 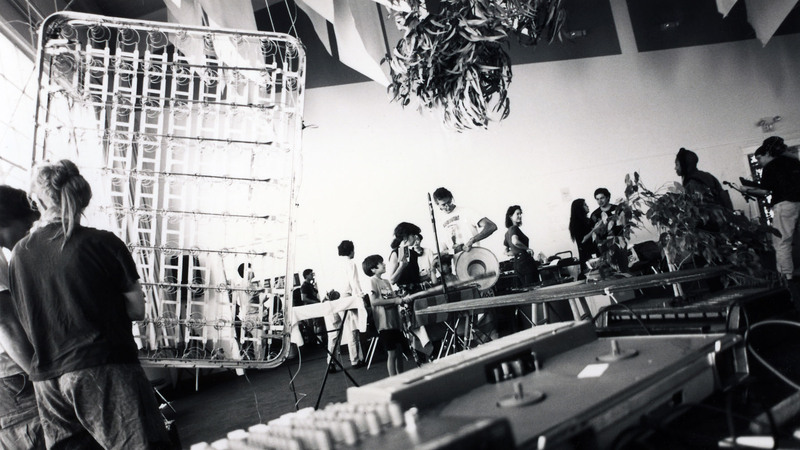 Their work not only sparked performance art communities in the Bay Area, but helped shape emerging interdisciplinary currents during the 1960s in live electronic music, film, projection, performance, and electronic theater. 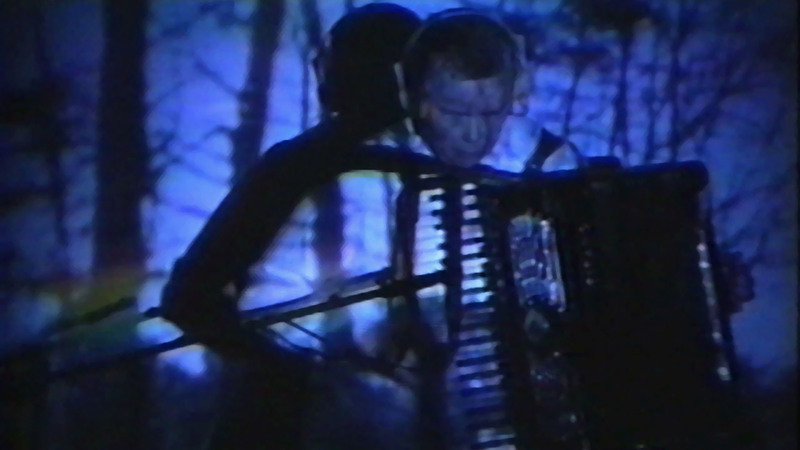 In Ramon Sender’s Desert Ambulance, a collaboration with Pauline Oliveros (accordion) and Tony Martin (projections), the performer is embedded in an electronic space composed of film, slide, and liquid projections: seamlessly embedding her physical presence within the space of the electronic imagery to form a composite whole. The projected image no longer functions as background or purely scenic design, rather, it serves as an immersive environment for the performer to enter into and inhabit. Following the San Francisco Tape Music Center Retrospective I continued to investigate seminal experimental music theater works that re-imagined the concert stage. I was particularly interested in the work of John Cage, a “composer of media” who challenged musical convention by embracing not only any kind of sound or noise, but also non-musical elements that included actions and gestures drawn from everyday life. Cage was instrumental in blurring the distinction between art and life, his music tending towards theater as a more inclusive arena in which any media or event could be incorporated into the composition. In 1989 I created a realization of John Cage’s notorious Musicircus, a two-hour multi-layered collage of works by the composer scored precisely in time and space, performed at the Cowell Theater in San Francisco with Cage attending. 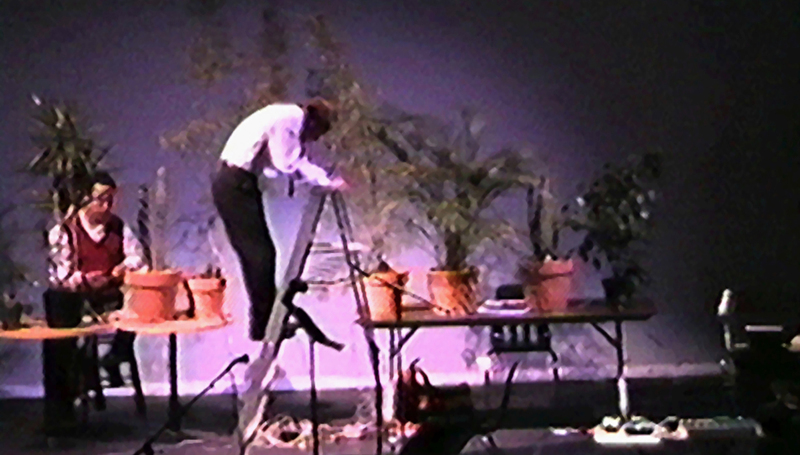 In the figure above the percussionists perform various sounds (amplified cactus) and actions (climbing the ladder) as superimposed time-based events during the course of the performance. In 1990 I directed Karlheinz Stockhausen’s seminal music theater work Originale (1961), a classic avant-garde Happening that had not been performed since its initial stagings in 1961 (Cologne) and in 1964 (New York). 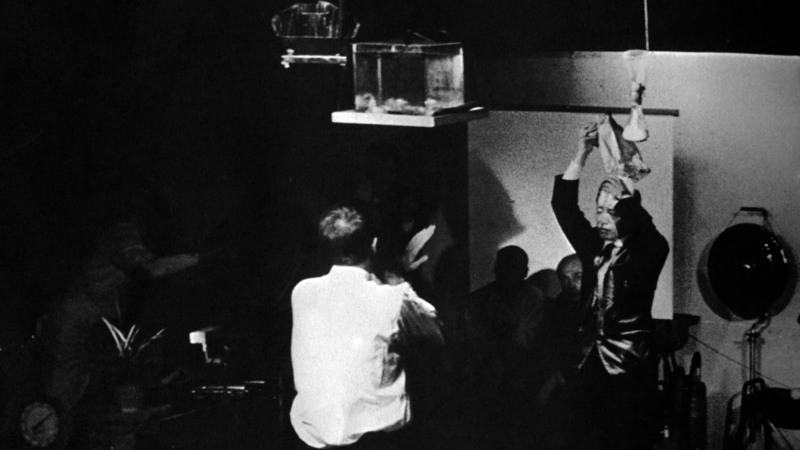 The debut production included Fluxus artist Nam June Paik as the action musician performing scored actions under the conducted direction of Stockhausen (see figure below). Originale treated all aspects of everyday life, actions, gestures, and unconventional props (such as a live chicken) as compositional elements integral to the performance. My 1990 production of Originale explored the dissolution of the arbitrary, invisible divide of the fourth wall that traditionally separates the audience from the stage as an impermeable barrier in theater. As with the Happenings of the early 1960s by artists such as Allan Kaprow, Robert Whitman, Jim Dine, et. al., which influenced Stockhausen’s Originale, the performance explored the social intermingling between performer and audience to eradicate the hierarchical separation that excludes the viewer from engaging in the work as an active participant. In the figure below, the actors photograph the audience with instant Polaroid cameras to draw the viewer into the action. The following year I created my first original large-scale music theater work, Arches (1991). In this production, which took place in the cavernous, modular space of Theater Artaud in San Francisco, I re-configured the seating area by shifting the audience into a surround configuration, situating the playing area in the center where the performers traversed a labyrinthine mediascape with interactive sensors. Each section of the audience had a unique proximity to the stage, with contrasting vantage point and perspective, thereby creating a multiplicity of interpretations appropriate to the form of the maze with its circuitous path leading to the center. 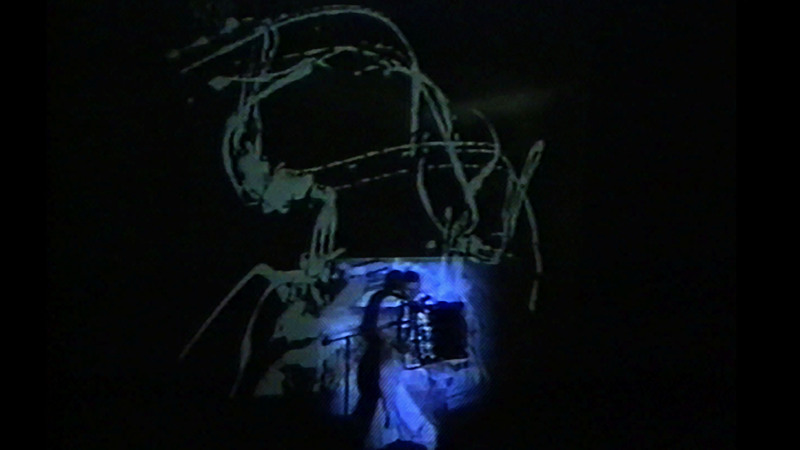 The labyrinthine stage configuration was designed as an interactive, virtual environment consisting of a layering of projections, video monitors, sensors, and surround-sound: embedding the performers into the space of the media as a visceral simulation of the immersive nature of the contemporary digital landscape. The narrative of Arches formed a series of ‘scenes’ or ‘vignettes’ which added up to a microcosm of a life, rendered with all the technological complexities, revelations, wrong-turns, and contradictions inherent in media culture. In my ongoing research of the work of John Cage, I produced another performance of Musicircus in 1992, a memorial event that took place just weeks after the composer’s death. In this Cage production I altered the relationship between audience and stage in order to more dynamically activate and engage the viewer. I re-imagined the performance environment as theatrical space without a stage, enabling the viewer to walk through and explore and navigate the performance area according to their own discretion. The result was an integration of live performance and installation, more completely breaking the formality of the concert setting, thus removing the strict boundaries that traditionally delineate time, stage, performer and viewer, resulting in an entirely free and open experience of the work. 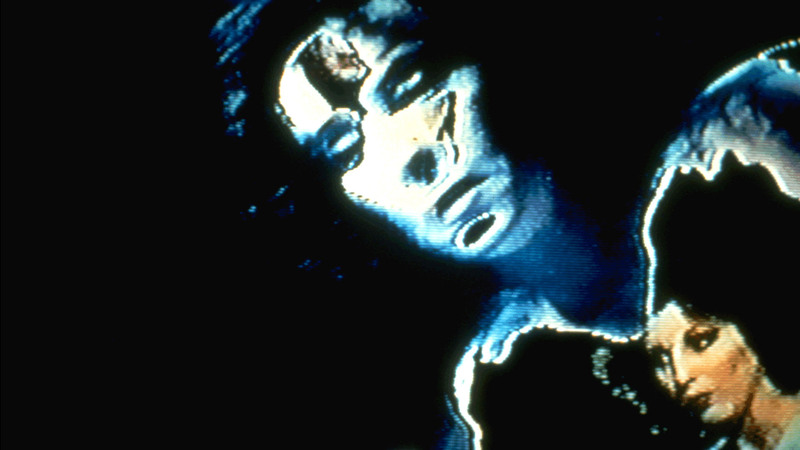 By the mid-1990s, as the Web became a dominant medium for experimental new media art, I began to explore the network as a new space for live media and immersive audience experience. 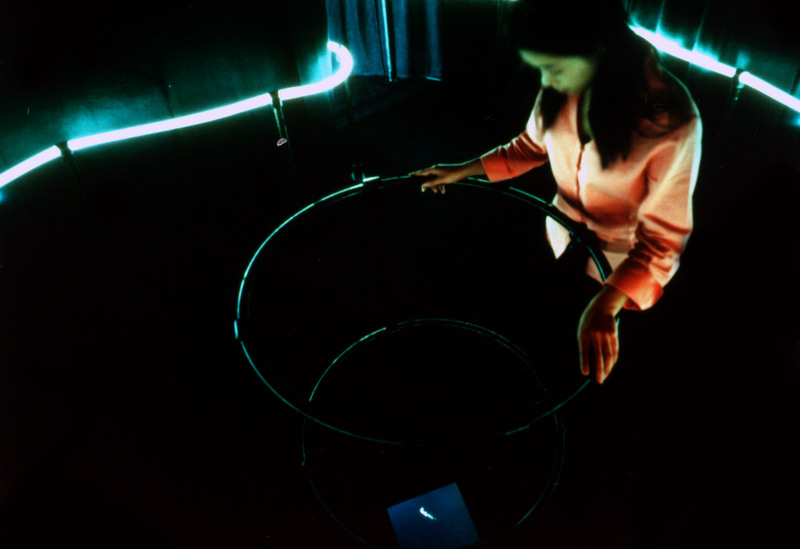 In 1998, together with media artists Ken Goldberg and Gregory Kuhn, we received a commission from the InterCommunication Center (ICC) in Tokyo to create Mori, a networked installation conceived as an Internet earthwork. 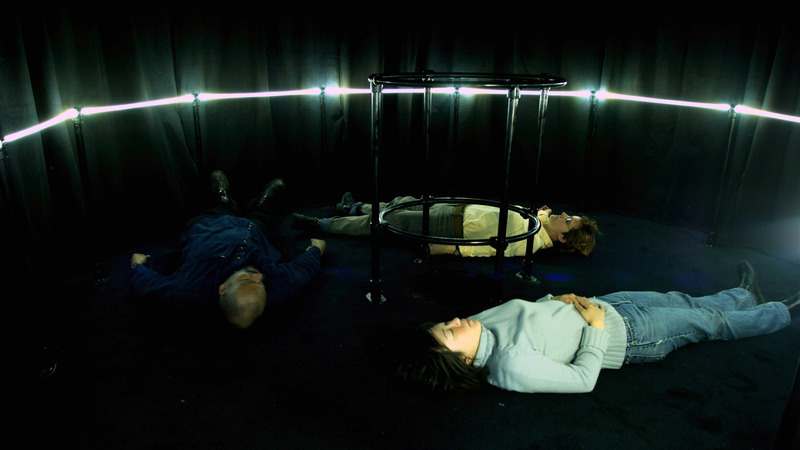 Mori, which debuted at the ICC Biennial Exhbition in 1999, connected the viewer with the earth as a living medium via the Internet transmission of seismic signals between the University of California, Berkeley Seismographic Center and the installation. The live seismographic data was used to control audio samples of the earth’s movement, along with light traversing optic cables and a monitor at the center of the space visualizing the “trace” of the earth’s activity. The viewer, immersed in the live audio-visual fluctuations of the installation, experienced an expanded sense of networked space through the immediacy of the transfer of the earth’s real-time oscillations via the Internet. 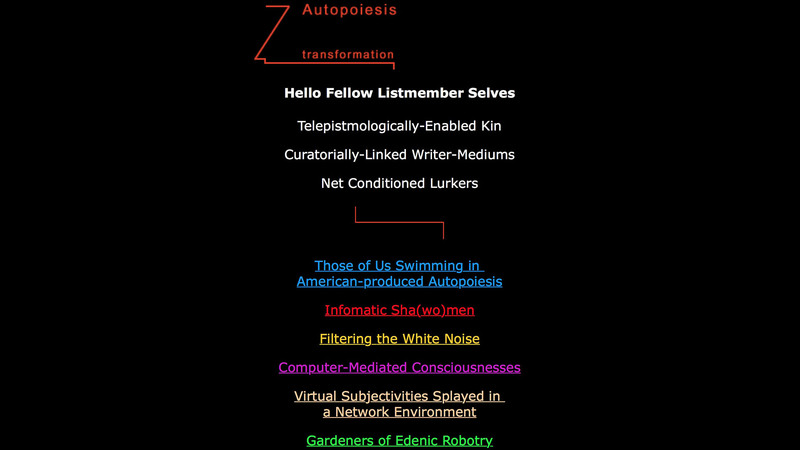 The Telematic Manifesto was compiled from an online mailing list discussion group involving an international consortium of net artists and new media scholars for a three month duration: aggregated and published as a hypertextual Web archive from the collaborative discourse. 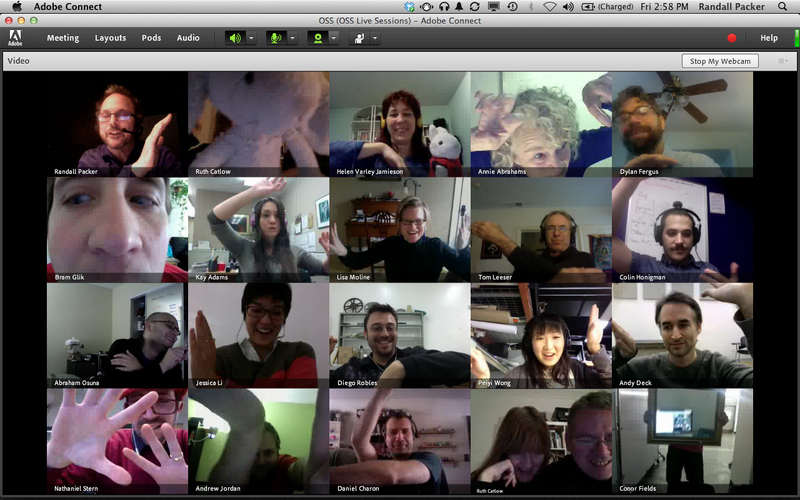 Years before social media enabled Web-based conversation, the Telematic Manifesto constituted a third space network of relations bridging the local and remote via a Web server: a distributed communications space for creative dialogue that expands according to the proximity and number of participants. In 2001, after moving from San Francisco to the nation’s capital in Washington, DC, I created the virtual government agency, US Department of Art & Technology (USDAT) as a Web-specific performance work. The Web was used to construct an imaginary world parodying government systems and bureaucracy, a virtual online space for articulating a post-9/11 call-for-artistic-action. 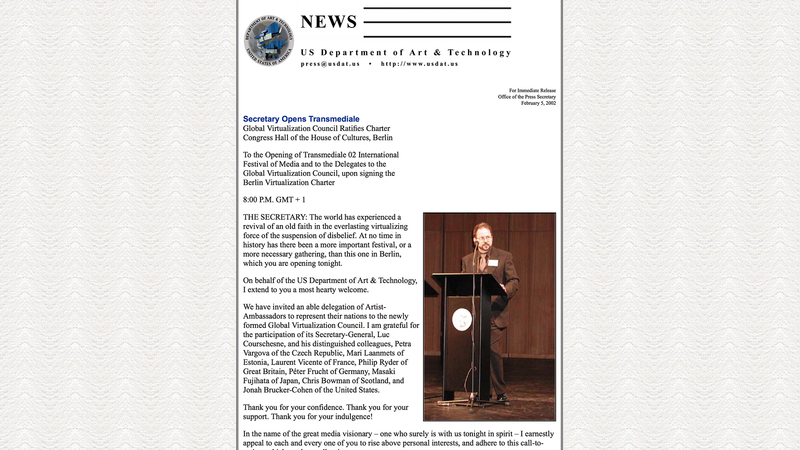 As the Secretary of USDAT, I used the Web as a virtual performance platform to deliver the message of the artist as a “mediator on the world stage.” The project brought together a collective of artists participating as USDAT staff in the appropriation of political symbols of control and power through techniques of media and virtualization: involving speeches, proclamations, manifestos, installations, and online manifestations of artistic expression. The Web thus afforded an illusionary theatrical edifice through which to visualize, perform and convey an artistic construction articulating social and political issues: dispersed freely and openly via the network. In 2003 I introduced real-time, streaming video into my work under the auspices of the USDAT with the Media Deconstruction Kit (MDK). The project was my initial foray into the emerging idea of the citizen journalist, those who independently began using alternative online media to express opinion. 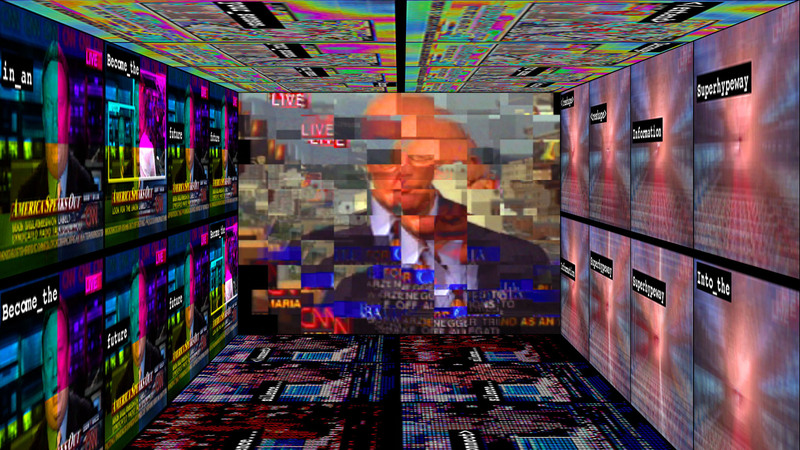 In the case of MDK, a critique of the role of cable news, I positioned myself as an artist disrupting the broadcast. As an act of citizen journalism, the MDK aspired to give greater access to artistic voices generally excluded from the mainstream media as a challenge to corporate-controlled media giants: who through their moneyed power and mechanisms of propaganda drive the narrative of our political and social discourse. The project appropriated a live feed from cable TV news, distorting its contents, and instantly rebroadcast the manipulated signal to the Web: converging broadcast media with Internet streaming years before this confluence became popular. 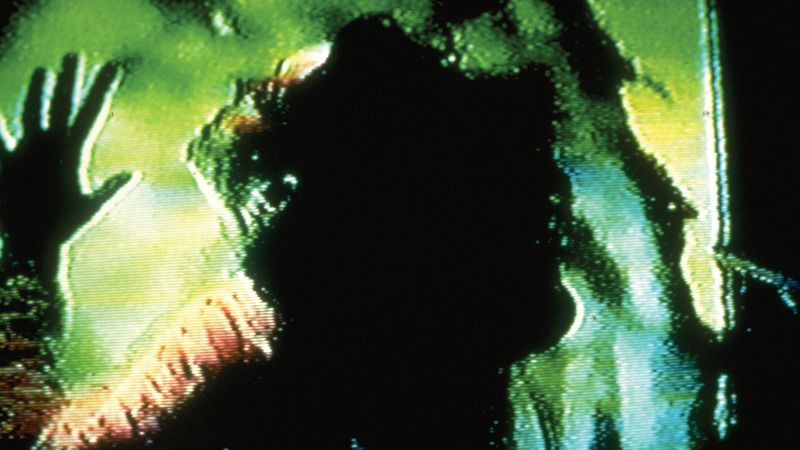 As a form of resistance to the systems of control that govern broadcast television and its propaganda, the MDK reconfigured and amplified the disinformation of broadcast media into an immersive, sensorial, multimedia experience. In the early 2000s social media was beginning to take shape, with blogging becoming one of the earliest new online forms of alternative media and independent journalism. The blog platform essentially opened the artist’s studio to an immediate audience, a new stage and publishing platform for the instantaneous distribution of writing, media, and projects as they unfold: collapsing the temporal space between the germination of a work and its worldwide dissemination. 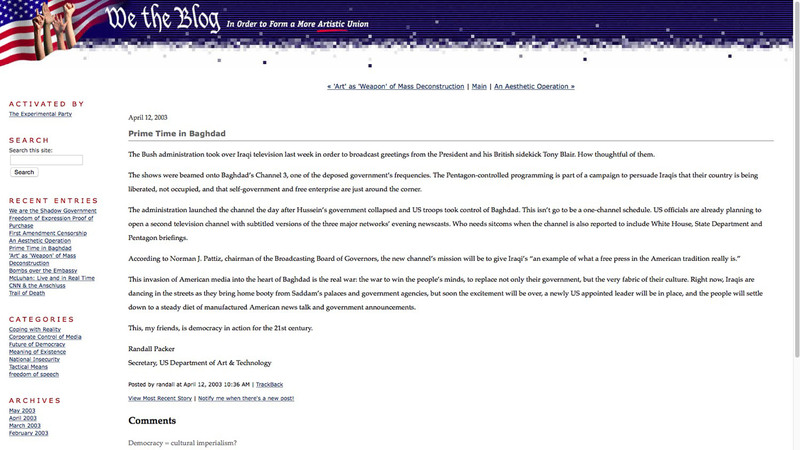 My first blog project was in collaboration with artist Jeff Gates, We the Blog (2003), under the umbrella of the USDAT project, in which a group of participating writers, artists, and media theorists responded to the outbreak of war in Iraq. Unlike the Telematic Manifesto, the blog platform enabled participants to directly publish to the medium of the Web. The blog catalyzed a number of enhancements to online discourse through its database, enabling public discussion through commenting, the organization of posts into expressive categorization, and searchable time-based archives. We the Blog demonstrated how an online discussion space could generate a historical record of discourse critiquing critical issues relevant to a specific moment in time. Two years later in 2005, I created The Blog-Chronicles of the Secretary-at-Large as an online journal to develop the music theater performance work A Season in Hell (2010), the sequel to the USDAT project, documenting a semi-fictional autobiographical descent into the Underworld of America. The medium of the blog served as an ideal platform for narrative construction in a performance project that required an extensive database of documentation, creative writing, and research. In 2009, the Blog-Chronicles of the Secretary-at-Large transitioned to my current blog, Reportage from the Aesthetic Edge, which to this day, is a writing-medium for documenting studio production, observations on social and political events, and writings about new media culture. Reportage from the Aesthetic Edge now serves as an extensive database archive and online repository with nearly 500 posts for the creation of larger media works, essays, and projects. In 2010, I began to explore the network as a space for live performance with the re-configuration of my Washington, DC studio for Internet broadcasting. All the various threads of my artistic work were shifting to the network, deep within the confines of my “underground studio bunker,” where I could deliver performances instantaneously anywhere in the world: collapsing the boundary between creation and audience: the studio as production environment, stage, and mis-en-scene. I began at this time to develop The Post Reality Show, an Internet performance project and critical investigation challenging “post real” conditions in media, political, and popular culture: the confusion of the real and the imaginary. The project was influenced by Jean Baudrillard’s seminal book, Simulation and Simulacra, and the notion of “hyperreality”: in which through the effects of media and its simulation of reality, the distinction is blurred between that which is real and that which is not. It is from the vantage point of the studio process – an artist’s immersion into the “media flow” – that I perform as “carrier host” of The Post Reality Show, chronicling the effects of my own exposure to the 24/7 assault of information and the loss of the real: a performance of critique through ingestion. In 2012, I performed a workshop edition of The Post Reality Show: TALK MEDIA!, presented in conjunction with the 7th Annual Capital Fringe Festival in Washington, DC, the first ever netcasted, online performance at the Fringe. 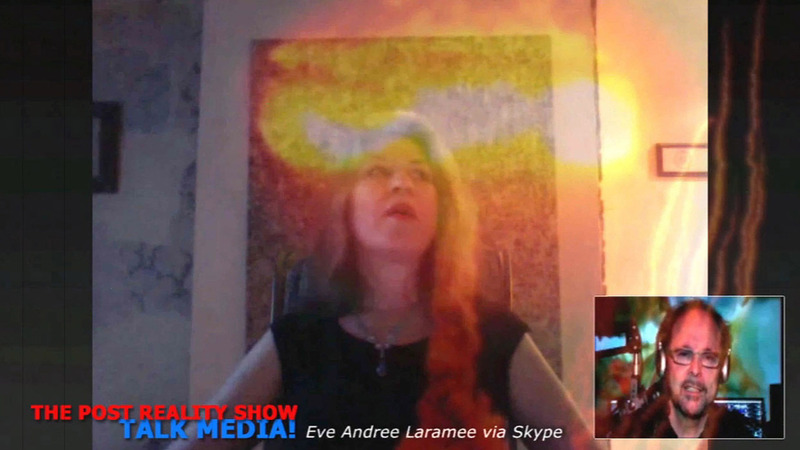 Ten shows were broadcast live over a two-week period, featuring artist interviews via Skype focusing on topical, experimental and controversial areas of artistic investigation and media culture. The Post Reality Show: TALK MEDIA! was broadcast over Livestream with audience interaction via chat, emphasizing the participatory nature of Internet media and its integration with and insertion into existing online social media spaces in order to catalyze and distribute critical dialogue within the context of performance art. 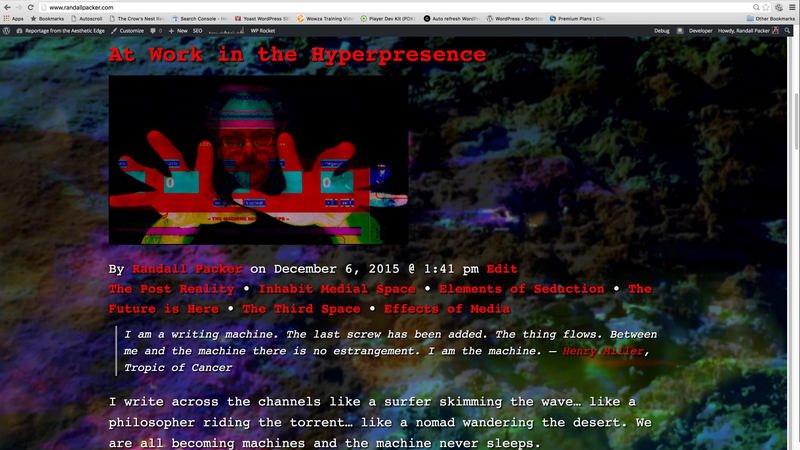 Through over five years of development, writing, and production for The Post Reality Show, the project has served as a research laboratory for exploring the future of artist-driven broadcasting: the performance of live expression and social critique facilitated by the distributed networks of the Internet. With the integration of today’s global broadband Internet connections, social media and mobile devices, the technological possibilities for live broadcasting have advanced dramatically. Motivated by this potentiality, I am now introducing the idea of the Third Space Network, a new direction for live expression facilitated by distributed networks of artists and audiences. 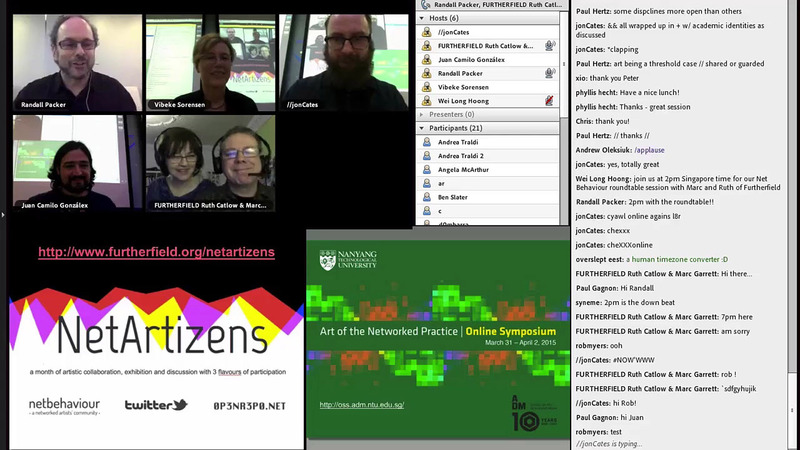 The idea of the Third Space Network recently crystallized during the Art of the Networked Practice | Online Symposium and NetArtizens Project I organized in 2015 in collaboration with Furtherfield’s Marc Garrett and Ruth Catlow. The symposium events combined performance, exhibition, online discussion, social media, keynotes, and panels to explore and debate the role of the network in our individual and collective practice as artists, scholars, and arts educators. The project was sparked from my ongoing exploration of live, transglobal communications as a catalyst for collective art and discourse. Attendees from over 40 countries across the globe participated. After nearly thirty years of experimentation with live performance, experimental theater, networked installation, online social spaces, and various forms of creative dialogue, I now envision the Third Space Network as an arena for facilitating new forms of live expression that unite artists and audiences from culturally dispersed locations from around the world. The Third Space Network is intended to connect artist and viewer in the immediacy of the live broadcast to discover and make accessible the kinds of artworks, experiences, explorations, and interactions that can only be derived from globally networked media that collapses geographical distances and cultural boundaries. Theater is an evolving concept that has been undergoing radical transformation since the earliest days of the classical Greeks some 2500 years ago. And yet, the fundamentals remain the same: theater is a space for challenging complex social and political issues; it is a social forum for catalyzing and bringing together a powerful sense of community through catharsis; and theater is a medium that brings the synthesis of language, music, and media expression to live audiences. The Third Space Network is intended as a new kind of theater that is accessible to all corners of the globe, a theater of the future for the performance of actions, ideas, and media broadcast from the desktop.